So what exactly is a foreign language faux pas? Well, before we look at foreign language faux pas, lets first define faux pas (pron. : /ˌfoʊˈpɑː/ plural: faux pas /ˌfoʊˈpɑːz/). Have you ever found yourself in a social situation saying or doing something that you realise, in hindsight, you should not have done or said? Perhaps, for example, you’ve congratulated someone for becoming pregnant, only to find out that they are not actually pregnant but have, in fact, recently put on a few extra kilos. If so, that is a faux pas! If you’re still not sure, watch the amusing You Tube video below to get a good understanding of what a faux pas is. In this , video British actress, Catherine Tate, plays a tactless woman who embarrasses herself and those around her when she mistakes a deaf man’s sign language with a game of charades. Faux pas is actually a French expression which literally means false step. In English, however, we use it to indicate a social blunder or mistake, as illustrated in the examples above. French speakers, by and large, use the word gaffe to describe a similar awkward social situation. They do, at times, use it figuratively, but to the French, a faux pas describes a physical loss of balance. Faux pas are generally committed out of ignorance, thoughtlessness or lack of tact rather than out of spite. If you are witness to somebody else’s faux pas it is preferable to take them aside and correct them privately. However, if this is not possible, at least try to correct them calmly and politely so as not to cause further embarrassment to those who have witnessed the awkward situation. You will often find the the expression faux pas preceded by a classifying adjective or adjective phrase such as fashion, cultural, email or foreign language. 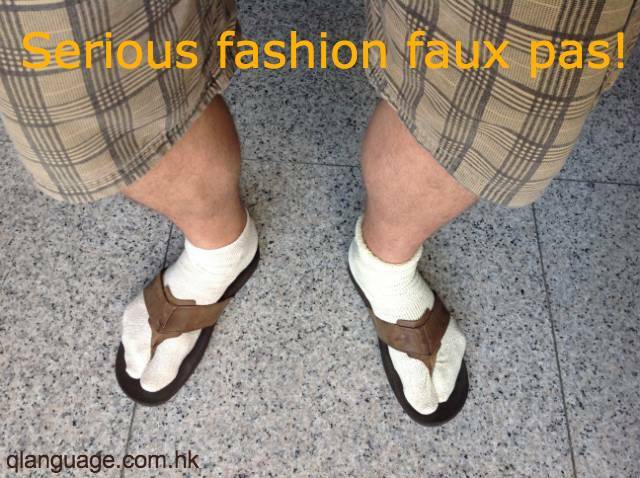 An example of a fashion faux pas is a man wearing socks with sandals (a lovely look, every time, don’t you agree?). An email faux pas could be sending an intimate and very private email to your partner but cc-ing everybody on your contacts list. Very embarrassing indeed! A cultural faux pas might be giving someone in the Middle East the ‘thumbs up‘ ( a gesture generally considered positive in western culture), particularly in countries like Iran, where it is considered one of the most offensive gesticulator insults you could offer. It’s very similar in western culture to giving someone the middle finger or ‘the bird‘. Here is a good list of cultural faux pas to avoid. So, what about foreign language faux pas? Well, if you’ve ever learned a foreign language, which most of you reading this post have, you will likely have made at least one foreign language faux pas. A foreign language faux pas is when you accidentally use a word in your target language that sounds the same as your own language but differs in meaning completely. An example of this is the English word constipation (a condition in which there is difficulty in emptying the bowels) and the word constipação, the Portuguese word for the common cold. The other type of foreign language faux pas is to use the wrong word completely in your target language because it sounds very similar to the word you believe to be the correct one. An example of this, which I found here, is the story of a man working on a building site in Spain. Obviously with limited Spanish language skills, the man suggested to his Spanish co-workers that they needed some branches to help prop something up. However, instead of saying, “Necesitamos algunas ramas para ayudarnos.” (We need some branches to help us. ), he replaced the word ‘rama’ with the similar sounding ‘rameras’, which in Spanish is a slang word for prostitute. Unfortunately, as the story goes, a somewhat careless translator at the company thought that the correct word for ‘embarrass’ was ‘embarazar‘, which is a Spanish adjective meaning pregnant. Take a look at the info graphic below for more funny foreign language faux. So, the conclusion is, when you are learning a foreign language, you are bound to make a foreign language faux pas at some point. Just be aware of the fact and try to avoid them as best you can by studying hard and aiming to perfect your target language. And please leave a comment to tell us about your foreign language faux pas. This is funny! 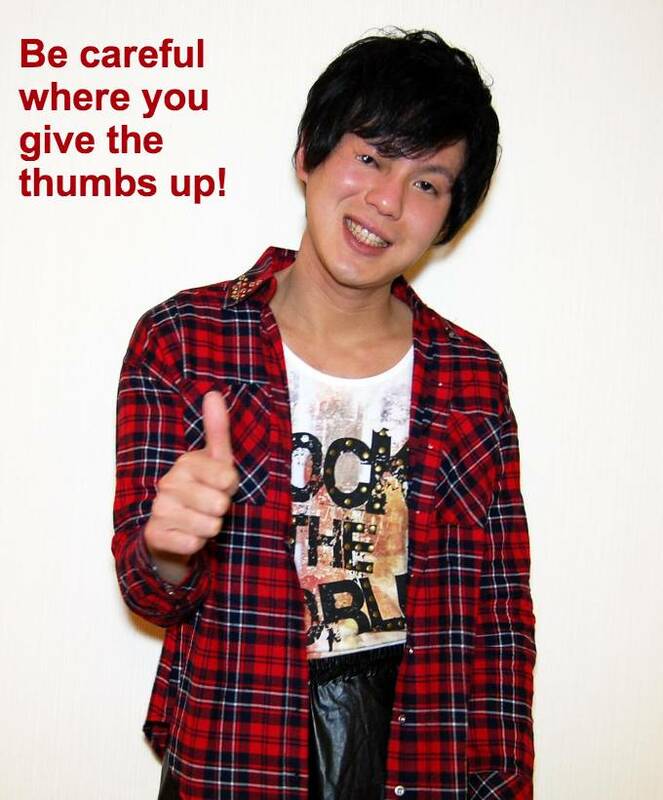 I always do the thumb up. But now I need to think first, haha! It was an interesting article. I have had a similar experience with a mobile faux pas. Nowadays we are using smartphones for a lot of our social communication and it is very common and easy to reply with informal messages to our friends. However, I have had a very embarrassing experience whilst messaging one of my friends. One day I was at a wonderful party. After the party, I immediately wanted to share a joke with my boyfriend, who was at home at the time, so I started sending him messages by Whatsapp. However, suddenly, I received a message from a friend which sais, “I don’t understand what you mean. 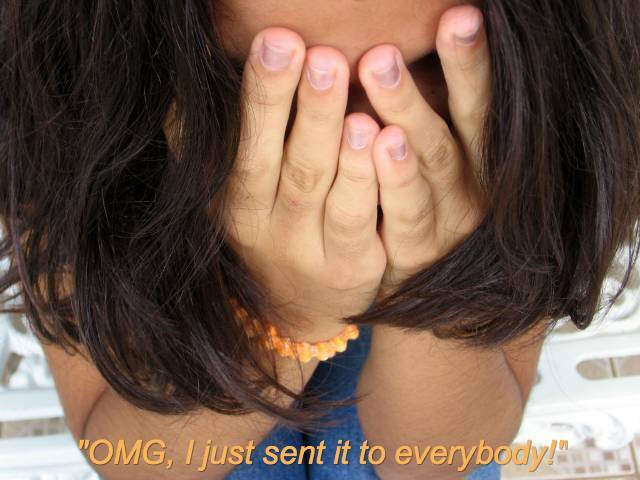 This is Joey Ma.” Oh, my god, I thought to myself, I have been sending out messages to the wrong person. I should have been sending the messages to my boyfriend, whose name is JOE Ma not JOEY Ma. So I promptly returned an apology e-card to my friend JOEY Ma. Fortunately, the messages were just of a causal nature – without any gossiping or anything else that could have gotten me into trouble. Later, I simply gave a call to my boyfriend directly. And then, JFK called himself a doughnut in front of most of the population of Germany.